Oval makeup brushes are taking the beauty world by storm, they have become the latest craze. The problem is the price tag that comes with it, Artis brushes start at £28 and thats for a small one and MAC retail them for £34. Personally, I can't justify the spend on them no matter how amazing they might be (unless I win the lottery, in which case, I'll take 2). Michelle from TSNC compared a Ebay version to the Artis ones and I was planning on buying them, until I headed into Primark one day. Hidden within their makeup brushes stand I spotted these oval brushes, a complete dupe for the expensive ones. 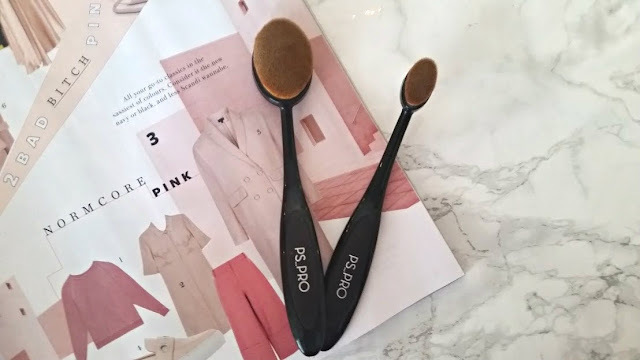 Ever since these brushes came on the scene they remind me of a hybrid of toothbrushes and hairbrushes - so odd but apparently amazing. The look of these are pretty simple and I like that about Primark in general, they don't ever make a big fuss. The brushes are a sleek black with the +Primark logo on the bottom of the handle. All their brushes are synthetic which are nice on the face and feel super soft. Both brushes however seem to soak up a lot of product, so its better applying on your face then blending rather than applying straight onto the brush. I have also washed these twice since purchasing and both times have retained their softness. Let's start with the larger one first which retails at £4.00, designed to be used for foundation/products that have to be applied to large areas of the face. The whole experience was very weird, I couldn't get used to the fact I had to brush my face as I went, not buff or tap. It felt like I had to drag the brush around to really get it going and it was pulling against the skin. It did however, give a flawless finish and by the end there was no marks from the brush on my face and everything was blended in nicely. There are 3 brushes in total, I have the large one and then the small one which is £2.50 - you can also get the medium sized brush for £3.00. This sized brush is perfect for concealer and applying highlighter. Obsessed with this brush is an understatement, it has changed the way I apply concealer. Under my eyes to blend all the product out to make me look less tired has never been so easy, it blends it in beautifully and even though it slightly drags on the skin - i love it. Still trying to get used to this whole trend, but I am going to keep on trying. I think my main issue with the large brush is that its too big for my face, next time I shall be picking up the medium sized and see if that a bit easier to use for foundation. 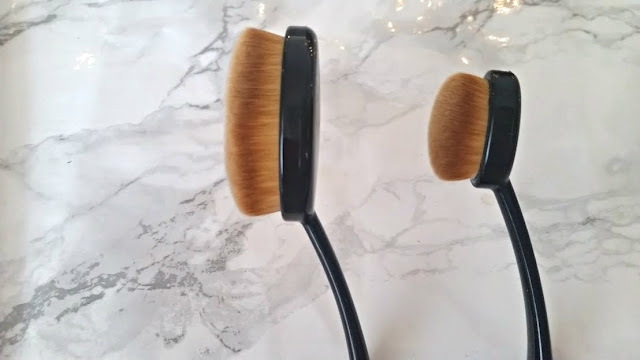 Have you tried any oval brushes? What do you think of them?